Growing up in the Ohio Valley, spending summers on grandparents' farm, and tramping the wooded hills over East did not provide us with any first-hand knowledge of a Burr Oak tree. Certainly the nearly thirty years we spent in San Diego did not afford an insight into the subject either! In coming to Indiana five years ago, we discovered that first Fall that “lo and behold”~~ there IS a Burr Oak in the yard next door!! 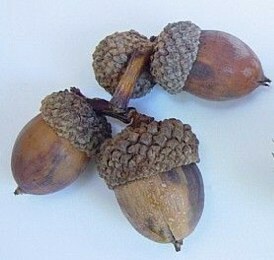 FINALLY, we have located the derivation of the pattern : ACORN BURR. Those crafty pattern makers relied on nature for the bulk of their inspiration, but apparently few of these Burr Oaks remain in today's world. We live in an area called Park Forest. It is full of ancient tree species, and we decided that those of you who have not been privy to such as this, might enjoy seeing the comparison in acorn varieties. 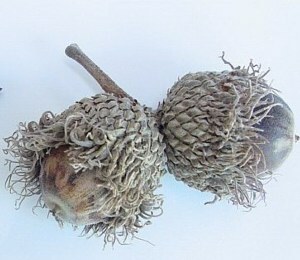 “Ordinary” Acorn and Acorn Burrs. This year, one of two Red Oaks in our yard has produced literally thousands of what we all know to be an “ordinary” acorn, (shown on the left.) 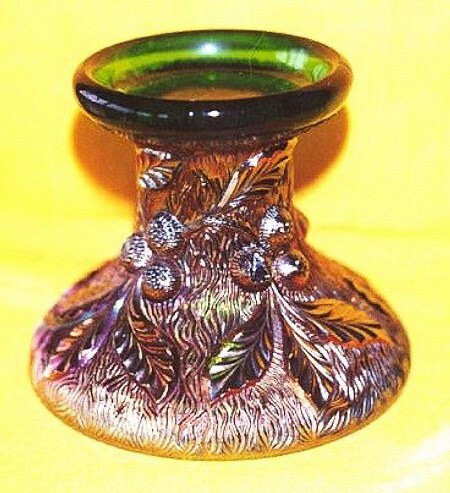 This is the acorn repeated on the Fenton Acorn bowls and the 9” Autumn Acorn bowls and plates. As you view the punch base having the Northwood Acorn Burr design, you can quickly see the correlation and interpretation in comparing the actual Acorn Burrs. There now!..... Isn't that interesting?